Japan has long endeavored to develop its capital, Tokyo, as one of the top global financial — given the status of the Japanese yen as the third international currency after the U.S. dollar and the euro; and large financial markets with abundant capital. To realize this vision, the Japanese government under Prime Minister Shinzo Abe’s “Abenomics” has taken various measures. First, the effective corporate tax rate was lowered from around 38 percent to 29.97 percent in fiscal year 2016. Second, the government introduced the Nippon Individual Savings Account (NISA) in 2014 and the Junior NISA in 2016 with tax-free treatment of all dividends and capital gains up to a certain limit on annual investment for individuals aged 20 years or over and for individuals under 20 years old, respectively — to induce individuals to take greater risk to diversify their financial assets. Third, the Bank of Japan (BOJ)’s massive monetary easing including exchange-traded fund (ETF) purchases as well as an increase in stock holdings of public pension reserve assets managed by the Government Pension Investment Funds (GPIF) have contributed to raising stock prices. The Tokyo Metropolitan Government joined in these moves by launching its own initiative to make Tokyo a top financial city in Asia, following the 2013 decision of the International Olympic Committee to select Tokyo as the host city of the 2020 Olympic Games. It would be a good opportunity to promote Tokyo as a global financial center given that a lot of attention would be paid to Tokyo over this period. In December 2016, the local government announced immediate measures to attract more than 40 foreign financial firms over the next four years including establishment of one-stop support centers with simplified procedures for license acquisition and acceptance of documents in English. Reducing corporate tax burden and improving the living environment for foreign professionals are expected to follow. To develop a truly competitive global financial center, meanwhile, Tokyo should more actively intermediate cross-border money flows — by attracting diverse funds from abroad as well as by generating risk money and circulating it abroad. Particularly, Japan has the potential to utilize abundant capital to emerging economies in Asia to promote financial development and finance long-term investment and infrastructure projects needed to sustain economic growth in the region. Japan’s vision is unlikely to fully materialize anytime soon because its financial investment continues to be destined for the United States and Europe and in the form of relatively safe debt securities. Moreover, Japan’s financial and capital markets lack diversity with a limited domestic investor base and limited gross capital inflows. While foreign investors actively invested in Japan’s stocks over the past four years, their decisions were influenced by the BOJ and GPIF actions so their long-term orientation is uncertain. Households remained net sellers of Japanese stocks over the same period. Moreover, the stock market became less internationalized as the number of foreign companies listed dropped from 11 companies in 2013 to only five firms currently. The unimpressive performance is consistent with the ranking of the Global Financial Center Index published by Z/Yen where Tokyo was ranked fifth after London, New York, Singapore, and Hong Kong. Tokyo needs to overcome three major constraints to make the vision more achievable. First, Japan needs to generate risk money. 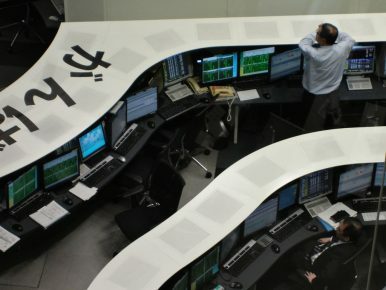 If the domestic financial and capital markets are unable to generate risk money, Japan needs to rely on foreign firms who are willing to take risk in Japan. To do so, Japan needs to provide greater incentives to increase their numbers including a cut in corporate, income, and inheritance taxes in the Tokyo special zone to comparable levels in other competing Asian economies as well as deregulating inflows of foreign workers. Second, Japan’s fintech industry needs to grow more rapidly. Japan’s rising notes in circulation (nearly 20 percent of gross domestic product vis-à-vis about 10 percent in the United States and the euro area) indicates that not only does the usage of digital currencies lag far behind other economies, but also that money creation is limited. To promote the use of digital currencies and fintech industry drastically, greater cooperation is necessary among dominant banks to develop mobile cash transfer systems without fees using payees’ phone numbers, following Swish, a mobile payment system established in Sweden. Not only do households and self-employed businesses benefit from lower transaction costs, but banks could also improve cost-efficiency drastically by eliminating redundant branches. Third, the low and negative interest rate environment may be incompatible with fostering a competitive financial center since foreign funds are unwilling to park their money in Japan unless they could obtain yen cheaply by taking advantage of negative dollar–yen basis value. Maintaining monetary accommodation may be necessary for the BOJ in pursuit of its 2 percent inflation target, but maintaining excessively-low interest rate makes banking, insurance, and pension businesses unprofitable and unattractive and deters “healthy” financial intermediation because of the difficulty of properly pricing the creditworthiness of borrowers. It may be time for the Government and the BOJ to come up with more realistic grand plans if the vision is to be an essential part of Japan’s growth strategies. Sayuri Shirai is a Professor at Keio University and a former board member of the Bank of Japan.